All organizations need public relations. Historically, public relations has been synonymous with media relations, helping leaders and organizations garner third-party media validation. While that is still an important piece of any PR strategy, it is only one component. Your audience lives in the digital world. The average American spends 24 hours a week online, according to a study by USC Annenberg. Therefore, if your organization is not also actively communicating in the digital world – with the right message – you are missing a huge opportunity. This is where public relations steps in. When done correctly, public relations uses tools and messaging to influence, engage and build relationships with key audiences, helping to shape and frame their public perception and move them to action. 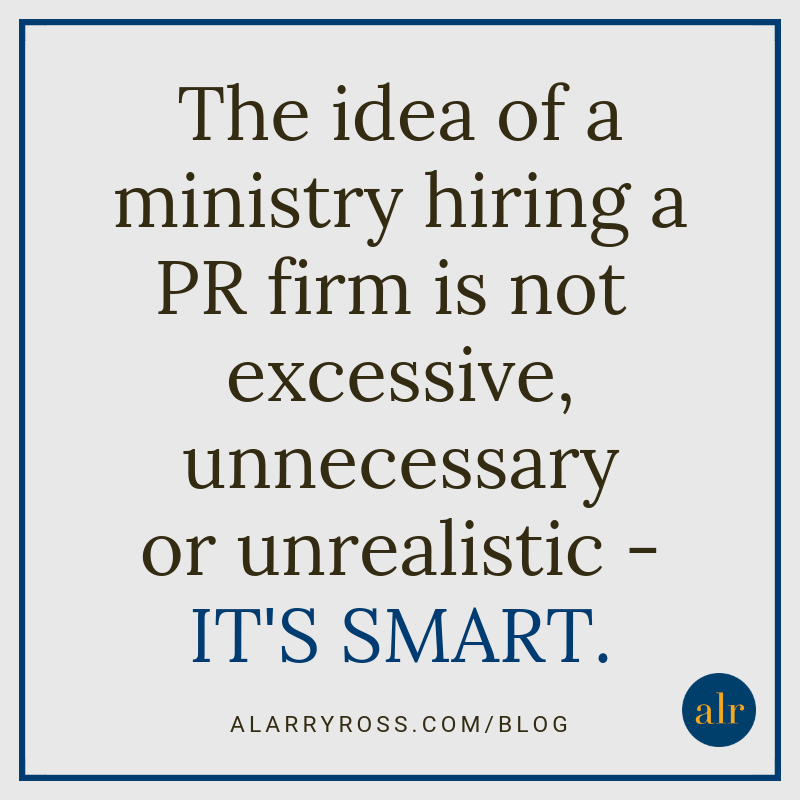 While it makes perfect sense for a million-dollar corporation such as Coca-Cola or McDonald’s to engage a public relations firm, to some, the idea of a faith-based organization or church hiring PR experts seems excessive, unnecessary or even unrealistic in relation to organizational budgets, but we disagree. For more than 24 years, our agency has specialized in Christian and faith-based public relations. We operate at the intersection of faith and culture, helping companies, brands, churches and Christian leaders take their messages into and out of the faith-based marketplace. 1) PR Multiplies Impact and Reach. Every brand has a story to tell, but for ministries, public relations provides the opportunity to share the story of lives transformed. As a Christian entity, you aren’t just “selling soap,” but rather you are changing lives. The work of faith-based organizations from nonprofits to churches is not just providing goods or services but is going one step further to offer hope. As a result, there are powerful stories coming out of the everyday work you do. A strategic public relations strategy will help you share your story with the right people, at the right time, using the right tool, helping to multiply your impact and reach. Faith-based organizations cannot exist without the support of generous donors. There are some entities that are blessed with a large built-in donor base compiled of gifts from a handful of major donors and a plethora of medium to small donations. But the majority of faith-based entities must cultivate this donor pool. Most giving individuals do not get jazzed about paying for staff salaries, building facilities or the general organizational needs of a ministry, but this is necessary for the day-to-day work to happen. While donors may not be excited to give to operations, they can get behind the idea of giving to mission. When a ministry properly positions its mission and value through public relations, donor dollars are likely to follow. 3) PR is a Biblical Concept. As Christians, we are to be witnesses for Christ – to make him known publicly. One could say that all followers of Jesus are PR agents for Christ. Developing and implementing a public relations plan, whether in partnership with a PR firm or using your internal resources, is an investment, but it is one that will pay off in the end.